Extremely bendable curtain track with embedded metal spines, which makes it exceptionally strong. Order this track if you need a continuous curtain track system with splices but no prefabrication. This track runs smoothly from start to finish on curved or straight applications. We offer prepackaged kits as well as custom cut length, minimum 16′. 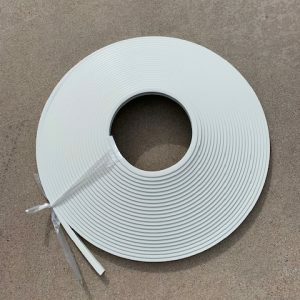 The flexible curtain tracks from the Flex Tracks are the best option for those in search of tracks to curtain a rounded bay window, curved partitioning or a circular compartment within the house. The unique make and design will give you a nearly soundless curtain system experience. The smooth and strong tracks can be used innovatively within the household or the workplace. 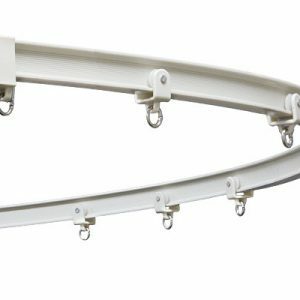 The bendable curtain track is designed with a metallic exoskeleton to add to its strength and durability. Moreover, the strong exoskeleton doesn't compromise the bending ability or the elasticity of the tracks in any way. So, you get durable tracks that can be bent easily. No need to cut and weld to form the desired shape to curtain your property. This track has versatile application. Due to its high durability, it can also be used as straight curtain tracks. This is best used to make curved partitions other than using it to curtaining bow windows. In exhibitions, it can be used to separate different categories as well as the exhibits in the exhibitions. Partitioning of shower space in the baths, changing rooms in the living rooms or for partitioning two sides of a room. This elastic track can be mounted on the ceiling to give you full privacy. We also have the kits that are necessary for installation of the tracks at your place. The smooth track is nearly soundless when you are opening or closing the curtains. So, you need to check your priorities again to decide on how you want it installed, on the ceiling or the walls. Smooth and continuous tracks of variable length of up to 82' are available with us. You can use the kits from our online shop to get your desired shape with a smooth drapery system at your place. An unboxed package contains up to a maximum 82' of smooth & continuous tracks that can be bent as per the requirement. You can either buy the complete package with the track or order them as per your requirements online from the website. The number of rollers needed per feet is 4. The number of end segments for wall mounting is 2 per installation or package. Mounting hardware is required every 10" - 12" on ceiling or wall. Affordable yet durable curtain tracks that can be installed with simple household tools. Forget about expensive curtain systems and give a wonderful look to your home or workplace for a much cheaper price.